Rutger Bregman's 2014 TEDTalk about universal basic income (a guaranteed stipend for every single person funded by a wealth tax) at the time seemed impossibly radical. A quarter of a million views later, the idea is being seriously discusssed by leading economists and government leaders the world over. 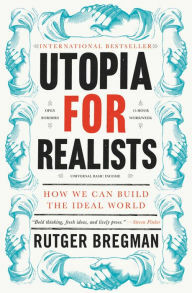 Bregman's idealism is surprising and challenging and worth listening to. He provides examples of how his utopian ideas could work, from a Canadian city that once completely eradicated poverty, to Richard Nixon's near implementation of a basic income for millions of Americans. Every progressive milestone of civilization—from the end of slavery to the beginning of democracy—was once considered fantasy. But Bregman's experimental ideas, like the elimination of poverty and the creation of the fifteen-hour workweek, could become a reality if enough people stop long enough to understand and accept them.